The term rock art was popularized in the 1960s, and is the most common way to refer to rock writings. However, it is misleading. Though the images can be highly artistic, symbols are combined to create messages and stories, and that makes them communication or writing. Native languages have words for writing. The Hopi word tutuveni refers to rock carvings and paintings. The same word is also used for books, magazines, newspapers and other written materials. Our local Takelma word for writing is se'l and is synonymous with black paint. Several parks around the country have been convinced by native tribes to stop using the term rock art. Instead they are using alternatives that emphasize the symbols as communication. Some parks are located on sacred sites that in native languages refer to the place as a place of rock writings. For instance, Pictograph Cave State Park in Montana is called Ammahpawaalaatuua by the Apsalooke (Crow) which means "where there is rock writings." Many of the earliest European descriptions of the images referred them as picture writing. They saw early on the connection between rock writings and Indian sign language. Both are methods of communication and are closely related. To further complicate the modern view of rock writings as art, many scientists have categorized the symbols from their own European world view rather than asking native elders what they mean or at least attempting to see them through native eyes. As a result, there are reams of documents separating the symbols into categories with names such as ladders, rakes, anthropomorphic figures, concentric circles, and so on. None of these have anything to do with what they mean. Really, the best example of rock art that I know of is Michelangelo's David! In years past, when I taught my rock writing class to school children, there was a magical moment when I saw the light bulbs in their brains flash on. That's when they started seeing the symbols as natives see them. And interpretation became a breeze. A completeness symbol was no longer a fish, it was a rope with the ends tied together. Two arrowheads with the points touching was no longer an hour glass, it was the symbol for conflict. Unfortunately, for many archaeologists who call themselves specialists in native cultures, the light bulb never flashes on. And they continue to publish their papers, ream after ream, and others believe them. Lava Beds National Monument in northeast California, home to thousands of symbols, has a poster on the bulletin board outside their visitor center that says, "What do they mean? This is a question that many who view Native American rock art most frequently ask. It is not a question that is easy to answer. The rock art within Lava Beds is plentiful, as well as the interpretations of their meaning. Rock art specialists have come to the conclusion that the symbols are not a form of written language, they are simply individual symbols. To decipher the exact meaning behind the symbols one would have to know the artist, to know the experiences of those who created the art, and to know the cultures of the indigenous peoples that were here. However it is still possible to appreciate the rock art without fully understanding their meaning." Lava Beds doesn't mention who the specialists were that they talked with though I suspect they were archaeologists or scientists of some kind. They also refer to indigenous peoples in past tense. They should know better! There are still plenty of native people around who have knowledge of their native cultures. Ironically, I have taught native storytelling rock writing workshops to park rangers at the monument though I suspect that was too long ago for anyone there now to remember. It has been my experience over the years that many who call themselves rock art specialists, some who have spent lifetimes documenting and categorizing the symbols, usually claim to know nothing of their meaning. And because they are specialists and don't know, they make the assumption that no one else knows anything either. After all, they have the knowledge and the academic credentials. And they won't listen to anyone who knows about the symbols, claiming their knowledge of native culture has no scientific foundation. Only scientists have the tools to get at the truth, right? Unfortunately, the poster at Lava Beds is read by thousands of people each year, and many believe what they read. A number of years ago, Lava Beds National Monument commissioned a study on a rock writing site that documents the Supernova of 1054 that created the Crab Nebula. The scientists took a sample of the paint, carbon dated it, and concluded that it couldn't possibly be about the Supernova because the paint wasn't quite old enough. But here's the problem. They didn't know that it was a tradition in the culture to touch up the rock writings from time to time to keep them vibrant. That's why so many of the symbols remained vivid for thousands of years but have faded dramatically in the past century and a half. With the arrival of Europeans that led to a fracturing of cultural traditions, that touching up stopped. The scientists, trying to do the least amount of damage to get their paint sample, scraped from the top layer. What they dated was a touch up, not the original. As a result, it is the official stance of Lava Beds National Monument that the symbols have nothing to do with the Supernova even though they match several other sites found throughout California. Understanding the rock writings requires a knowledge of native culture, including Old Time stories that have been passed down through the oral tradition. Yet because stories live outside the realm of their brand of science, most archaeologists dismiss them when it comes to drawing definitive conclusions about native cultures. In the 1870s, the Ghost Dance was done at my ancestral village of Coyote's Paw along the Klamath River. The archaeology report on the village site stated that three of the Ghost Dance trees were still standing. Hmmm, I thought. That doesn't sound right. There should be five. That's our sacred number. So I went to have a look. The three trees the archaeologists had identified were all within the confines of the village, lined up east-west and parallel to the river. The Ghost Dance was all about bringing ancestors back from the Land of the Dead to raise an army large enough to drive away the Europeans. So I walked downriver along the old Indian trail, and outside the village, there were the other two trees, continuing the line of trees that pointed toward the western Land of the Dead. Simple, but you need to know the culture and the mythology! In most works concerned with these mysterious markings, the term rock writing is seldom applied to them, in spite of the fact that this is the very term the Indians themselves have always used, and would thus seem to be the most appropriate one. (Tum-pe-po-op, for instance, means rock writing in Paiute. Other tribes have equally specific words). This omission is due largely to the fact that most scholars have never accepted the premise that these markings were indeed writing. The existence in the languages of many Indian tribes of a word for writing (in the sense of recording information for others to read) proves, at least that picture writing was long accepted as writing by the Indian. And who but the American Indian himself is more qualified to say whether it is or is not? The existence of such a writing system among the Indians offers a solution to the mystery, so long ignored, of why tribes had their own words for reading and writing. Such words were not borrowed from English or Spanish, nor are they descriptive (as are many of their words denoting modern gadgets). They are retained from a recent time when the Indians practiced their own form of picture writing. -- The Rocks Begin to Speak. Las Vegas: KC Publications, 1973. To be fair, I have met a few archaeologists who have become interested in the rock writings as communication. They have read the writing on the wall, so to speak, and it has been a joy to work with them and compare notes. My rock writing partner Roy Phillips is on the verge of publishing a book that interprets a dozen sites in Oregon. Many of these sites we visited together, and continue to visit. Like a good story, rereading the rock writings often reveals additional truths in the stories the Rock People tell. To protect the ancient rock carvings at Koomookumpts' Bed, Lava Beds National Monument drilled a hole through them so they could put up a fence. They also put up a sign that said defacing the rock is a federal crime. Giving in to pressure from the public, they removed this section of the fence and the sign. 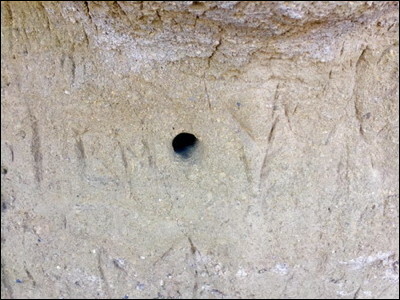 The hole and a few undamaged carvings remain. In the language of the rock writings, a circle often means that something important has happened at this place. 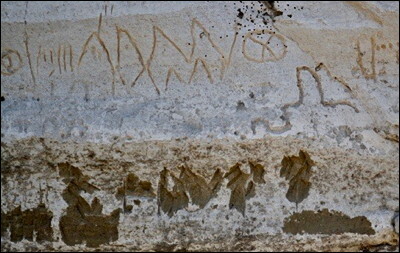 Much of the damage to rock writings at Koomookumpts' Bed has been the result of people shooting at the images. A chain-link fence provides no protection against this kind of cultural destruction.